AppAnalyzer is a Web-based tool that runs tasks to generate data from your Exchange servers (the grouping of which is quite flexible) and Windows Event Logs (see figure). It populates a SQL Server 2000 database (which it creates) with the results of configurable task executions. That information is then used to process cubes in SQL Server Analysis Services. These cubes provide the datasource used to generate HTML-based reports. 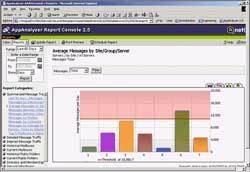 You can manipulate the reports and drill down (using Web controls in Internet Explorer) to get more detail on specific elements and analyze what’s happening on your Exchange servers from many angles. 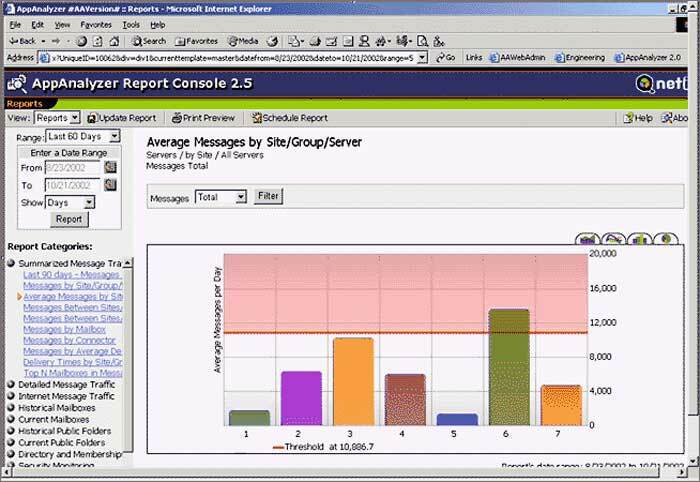 AppAnalyzer gathers information on Exchange mailboxes (although you’ll need to load an agent if running Exchange 2000), public folders, the types of traffic going in and out of the organization, and other useful tidbits. You can schedule data gathering, cube processing and report generation and have reports e-mailed or posted to a shared folder or FTP site. All in all, it’s pretty slick, but AppAnalyzer requires a robust server and network (so consider scheduling your tasks in the middle of the night or on weekends). AppAnalyzer makes excellent use of other key Microsoft technologies like SQL Server 2000 and SQL Server Analysis Services. It also has a strict set of requirements to work properly. Thankfully, NetIQ provides a pre-installation program that verifies that requirements have been satisfied. To begin installation, you must create the user accounts that AppAnalyzer utilizes to connect to the Exchange Servers and ensure that SQL Server and Analysis Services are installed somewhere on the network. Next, install the .NET Framework and Microsoft Outlook on the computer that will host AppAnalyzer and its services. Run through the checklist and install additional components on the Windows 2000 Server you’ll use. Finally, run the NetIQ Setup program. After installing AppAnalyzer, it’s a four-step process to configure it with a Web-based console. This works well, with the exception that, even if a step fails, it’s checked off as complete. NetIQ should add the ability to verify that a task completes before checking it off. I didn’t run across any major problems installing, configuring and running AppAnalyzer, except for a need to enable Basic Authentication on the IIS virtual directories (used by AppAnalyzer when generating reports). The reports were useful and easy to read, and you can create customized reports for additional details. AppAnalyzer isn’t for the small shop, but for one with at least several hundred or thousand mailboxes. The required hardware and software may put it out of the scope of the smaller enterprise but—for organizations that want to get a handle on what’s happening on their Exchange servers—it’s quite a useful tool. Note: AppAnalyzer 3.0 will be released within a few months and will support Exchange 2003.